Barbara and I were talking about the grape harvest. There are four vines in the garden, two of them mature, and yielding a lot. I take a pair of big stainless bowls and some pruning shears out to the grape vines, and fill one bowl with bunches of grapes. I rinse them with the garden hose and chase the spiders away, then pull the individual grapes from the stems, and put those into the other bowl. 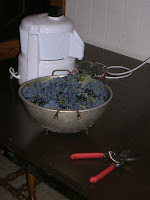 The grapes go into the kitchen, and through the Acme juicer. The juice is good stuff, and I’m sure Wile E. Coyote has one waiting for the time he catches the Road Runner. Barbara told me to keep some grapes for grape pies. She calls these grapes “slip-skin” grapes. They’re about half an inch in diameter, and you can squeeze the flesh out of the skins with your thumb and one finger. Pop the grapes, put the flesh here and the skins here, crank the flesh through a food mill to separate the seeds, put the skins and grape sludge back together in a yogurt tub, and pop ‘em in the freezer. Juicing takes a long time. This takes forever. I was saying the process was a bad time-versus-calories bargain, but Barbara pointed out that it was a pretty good calories versus calories bargain. We need to eat and drink. We need protection from exposure. We need to use our prodigious nervous systems. What do we need to fulfill the third need? I was listening to the New York Dolls’ The Glam Rock Hits, and complaining about the time I was spending processing grapes. And one of the immature grapes, the one we're trellising on the Beacon apple tree, is a Somerset, as far as I know, the only seedless grape grown in Minnesota. If you follow the link, you'll see that it isn't a perfect solution, but we'll see.